Sniffling Sisters Magic Elixers and Potions Apothecary Shop. 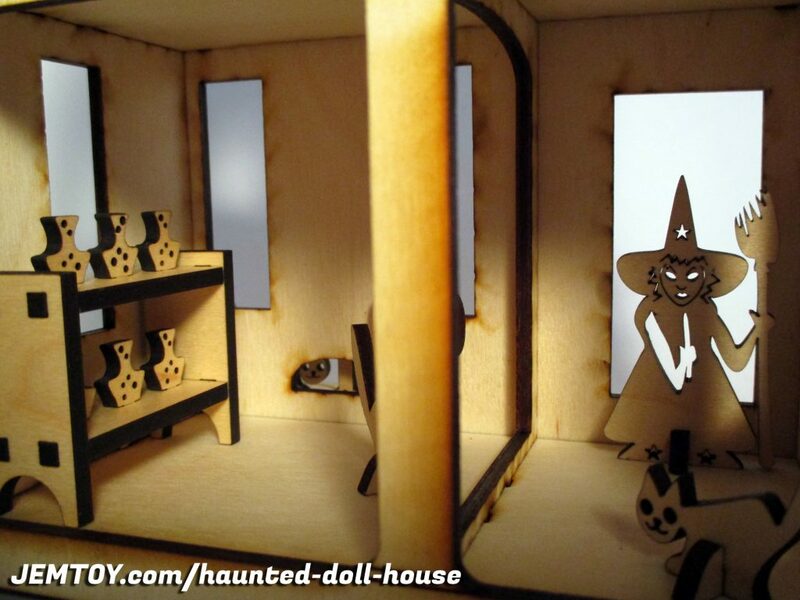 All wood haunted doll house kit you build yourself that comes complete with laser cut witches and cats to set up inside the spooky old Victorian doll house. Over 50 pieces. All you need is Elmer’s glue and maybe a paper towel to clean up any glue blobs as you go. The build is rather easy. Project takes less than an hour to complete. Watch video instructions above and follow along. Starfire Sniffling – Opening an Apothecary Shop was Starfire’s idea. She is a business smart and determined witch who is very detail oriented. Excellent with power spells, enchantment magic, and has a real sense of authority about her when talking on the phone. The outspoken leader of the Sniffling Sisters. Always with her eye on the light at the end of the tunnel. Starfire is cold, organized and shrewd. Starfire does most of the buying, selling and direct marketing at the shop, and is well versed at negotiating with elder trickster demons. Eclipse Sniffling – Is Starfire’s younger twin sister. Although it was Starfire’s idea to start an Apothecary Shop, it was Eclipse’s knowledge of plants, herbs, roots, and barks that made it all possible. Eclipse is quite the opposite of her sister in many ways. Eclipse is airy, speaks often of dreams, follows astrology, believes in fairies, has a big heart, reads quietly most nights, and loves all little children, cats, and critters. Like Starfire, she is dependable, reliable, and will actually show up on time, even if you think she’d be the type to be late. She makes most of the potions her sister sells at the shop. Her specialty is Love Potions. She is intuitive, empathetic, and kind. Some of Eclipse Sniffling’s recurring problems is that she doesn’t ever know she’s out of an important ingredient until she’s all out, and it can take days or weeks to order it. And she never knows the date or time of day… if it even is day. Is it day?… Usually when Starfire’s intellect fails them, it is the sweet good luck of Eclipse that gets them through the madness. Together the Sniffling Sisters are a great team. Cats! – Each set gets 3 or 4 cats at random, because cats are awesome and unpredictable. I love these little cats!!! Demon – Every coven needs a little demon imp to do their bidding. Right? This one has cute little bat wings, and is so happy to serve you. Crystal Ball & Stand – Gaze into the teeny tiny crystal ball. The little stand comes in various styles, you will get one at random. It’s these surprise details that make each set a one of a kind experience. Cauldron and Ladle – Witches just love to stir large vats of stuff. The Sniffling Sisters are no different. You gotta make a potion before you can sell a potion. Magic Potion Stand – Display your wares and sell potions to your customers. Sniffling Sisters Sign – Put the sign out front when you’re open for business. Bring it inside when you close. BONUS CHARACTERS – A place like Sniffling Sisters is gonna get some strange customers. You will get two random limited edition bonus characters, and a few more cats. Yes, you get MORE CATS!!! 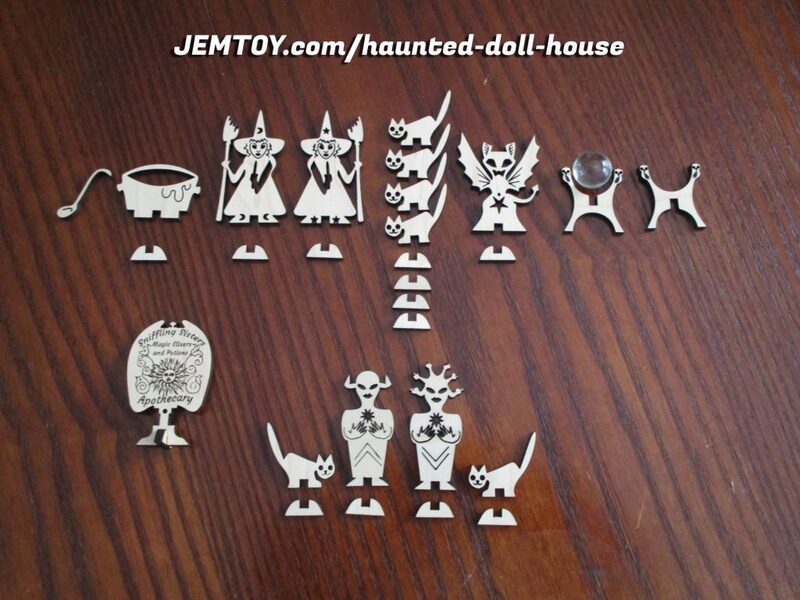 Lots of little D shaped Stands – Glue the little stands to the base of each character so they can stand and play. 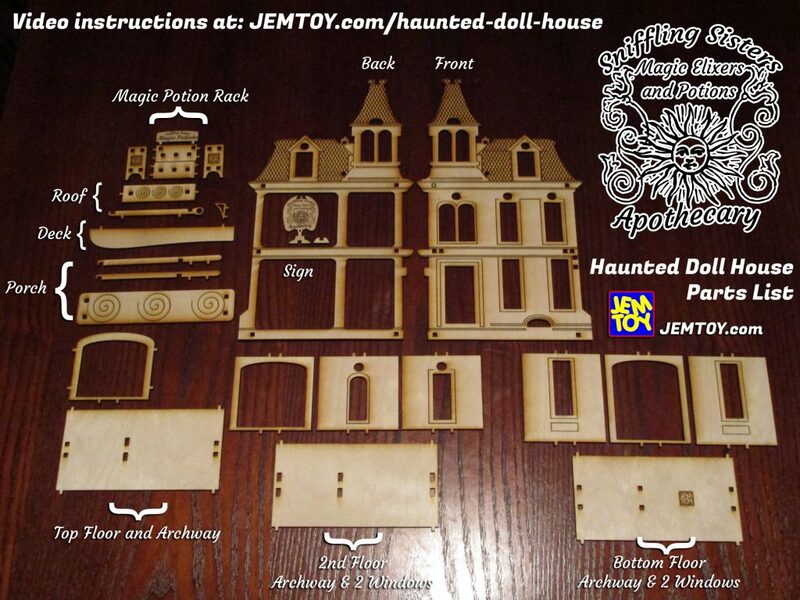 The completed JEMTOY Haunted Doll House is 11″ tall. The doll house rooms are 3″ deep. Characters are 2″ tall or less. 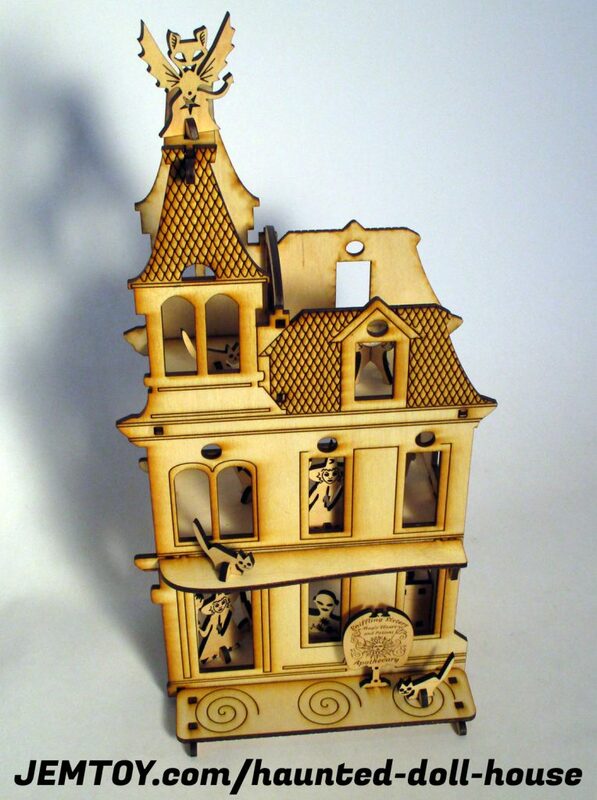 Free standing doll house can also hang and display on a wall using two push pins or small nails and hang the house from the top edge of the top back windows. Contains small parts, so this kit is not for the wee ones that might put stuff in their mouth – you know who you are! Parental supervision recommended. 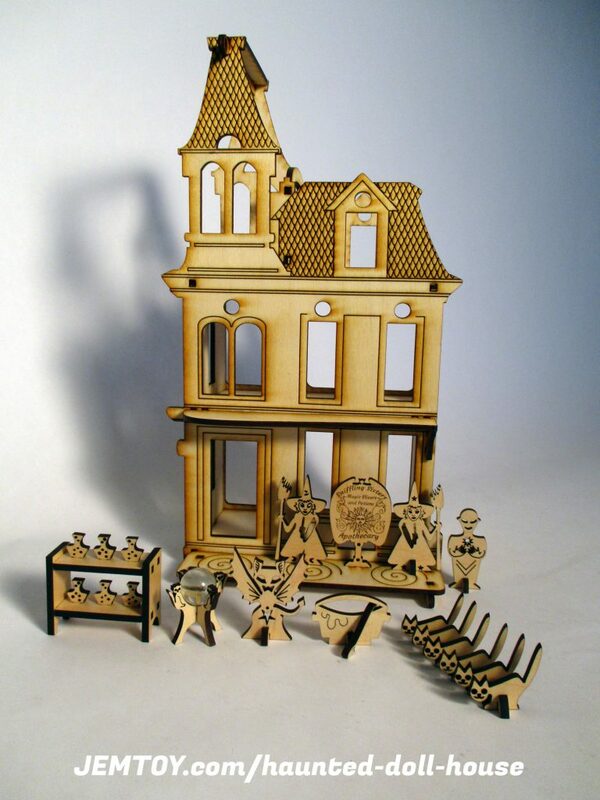 Great family time project to build together. 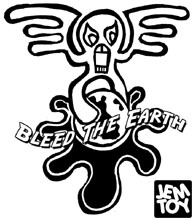 All you need is glue, and a firm belief in magic. 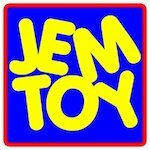 Available for a limited time in the JEMTOY Etsy Shop.